Heat oven to 375°F. Spray wire rack with cooking spray; place on shallow baking pan or cookie sheet with sides. 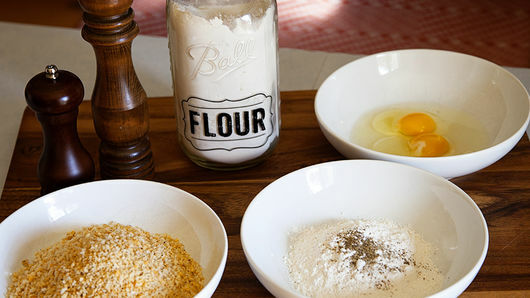 Place flour in medium bowl; add generous amount of salt and pepper to flour. Beat eggs in second medium bowl. Place bread crumbs in third medium bowl. Set aside. Place 1 chicken breast between 2 sheets of plastic wrap. Use meat mallet or heavy pan to carefully pound chicken down. You want the chicken to be the same thickness throughout. 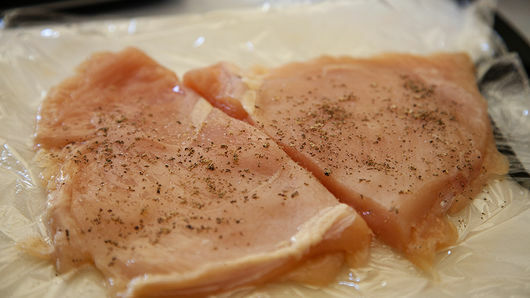 Remove chicken from plastic wrap; cut in half. Season chicken well with additional salt and pepper. Place chicken in seasoned flour; gently tap off excess flour. Place floured chicken into egg bowl; coat well. 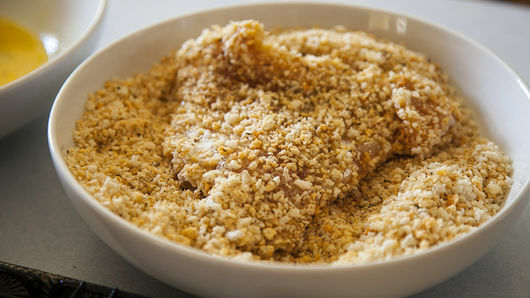 Coat chicken well with bread crumbs. (Make sure the chicken is covered with bread crumbs.) Place chicken on rack in pan. Repeat each step with remaining chicken breasts. Spray breaded chicken generously with cooking spray. Bake 10 minutes. Remove from oven. Turn chicken over; spray again with cooking spray. Return to oven; bake 10 minutes longer. Meanwhile, place tomato sauce in large fine-mesh strainer to remove a bit of the excess liquid. Remove chicken from oven. Place large spoonful of tomato sauce on top of each chicken breast. 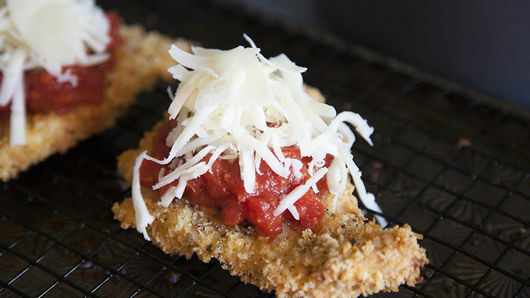 Top each with mozzarella and Parmesan cheeses. Return to oven; bake 5 minutes longer or until sauce has heated and cheese is melted. Cool 2 to 3 minutes before serving. 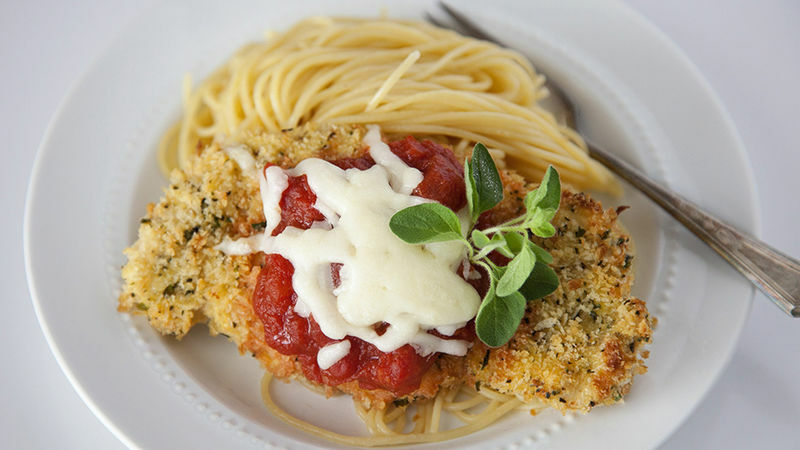 Serve this tasty chicken with some pasta and a nice green salad for a lovely weeknight meal. Make a few extra pieces of chicken without the sauce and cheese. These will make a fabulous chicken sandwich for lunch the next day.